Pine pantry cabinet with copper panels. Original design by Roger Kimball. 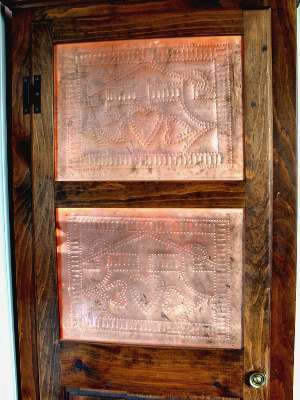 The pattern on the copper panels was copied from a pie safe in a historic house in Florida. 61 inches tall, 7-1/2 inches deep. The design of this cabinet was determined by measuring a multitude of food boxes: it is optimally suited to hold cake mixes, pasta, rice, etc. in a single layer. It takes up very little floor space, but in spite of its shallow depth, it holds a great number of items. The cabinet is so thin that I had to remove the back feet from the design so that it would lean against a wall and not fall forward when the door was pulled open. Thanks to Phyllis D'Eon for tooling the panels.